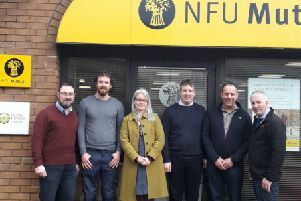 The Ulster Farmers’ Union, CAFRE, LMC, AFBI and NBA have confirmed arrangements for their ‘Healthy Cattle, Healthy Profits’ conference. This will take place on Wednesday, November 21, at CAFRE’S Greenmount Campus, Antrim, from 9.30am to 4.15pm. Beef production makes a significant contribution to the agri-food industry and our rural environment. To ensure that the sector has a viable future, consideration must be given to all elements of current production systems. The objectives of the conference are to highlight what the industry currently does well, but also to identify potential areas for improvement. Progress in beef production is the focus of the conference, with speakers from both practical farming and research backgrounds. Speakers and those attending will share their knowledge of how best to improve the health of their cattle and in turn receive a healthier profit. The conference is open to all with an interest in beef production. The fee is £20 and includes refreshments and lunch. Bookings are encouraged online at www.ufuni.org or if you need assistance please contact Angela in the UFU head office on 028 9037 0222.